Bzzzzz: Was Tomas quote on bullying incident concocted by Jun Alcover? * IMEE, SARA 'DAB' IN CAMPAIGN AD. In a video posted on Governor Imee Marcos's Facebook page, Imee does the iconic "dab" pose with Davao Mayor Sara Duterte. 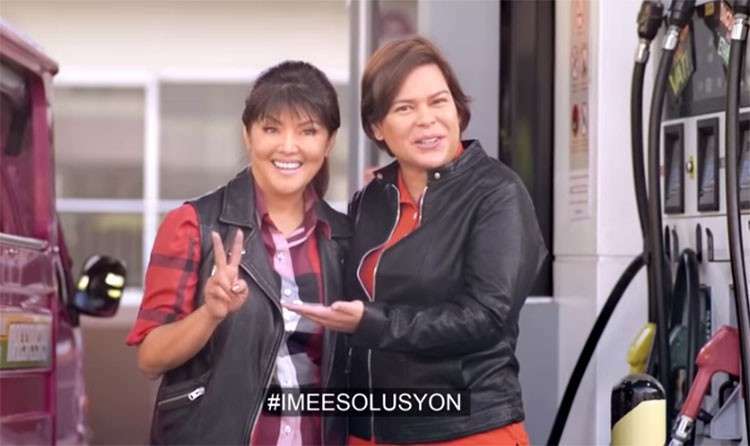 The clip opens with the tandem riding on a motorbike to a gas station chatting about "less talk if there's a solution" (Sara), and "prioritize action and solutions" and "set aside politics and bickering; people's welfare first" (Imee). In the 30-second ad, the line "Vote Imee Marcos senator" or "Reelect Sara Duterte mayor" is not seen or heard. No, neither does the catchphrase, "Let's move on." Cebu City Councilor Pastor Alcover Jr. is being sued by Mayor Tomas Osmeña for libel under the anti-cybercrime law. Councilor Jun, a former party-list congressman, allegedly posted a statement in Facebook about the Ateneo de Manila student bullying incident last year. * From Alcover and his sympathizers: If the mayor could dish it, he should take it. "Mi kakak man," posted Jun hours after the story broke. * Was it true that Tomas said, as posted on Alcover's FB wall, that the bully was just teaching the other boy a lesson? Since the mayor alleges in his complaint that he did not say it, could Jun prove that Tomas actually did? * Assuming it was false, was the statement defamatory? The bullying incident drew pro and con opinions as well as theories on why the bully did it. The opinions and theories were not necessarily defamatory. * It is political season. Should politicians clog the courts by suing every time they didn't like what their rivals said? Or is it just another form of propaganda? * Worse things were said and awful images posted about the mayor and yet the mayor picked a material that was not defamatory per se. A theory offered by Jason Monteclar on dyCM radio is that Tomas sued Alcover because Jun, he said, has long been an enemy of President Duterte. Alcover hates the president or has opposed him since way back in Jun's anti-communist years. Duterte must hate Alcover too although the public has not heard of presidential statements or moves against the former congressman. Jason said that by suing Alcover, Tomas might please Duterte: "an enemy of my enemy is my friend," the broadcast commentator said. That must assume that Duterte thinks Alcover is worthy of his attention and enmity. Jun might not have crossed the president's mind anymore. Don't expect the disputed Alcover posting would be the last to come from a politician during the campaign, which has long been going on, Comelec-declared or not. But only few would litigate, as Mayor Osmeña did. "Bawos lang," said another candidate in the May election said on radio. But the remedy is real and cyber-crime libel is punishable with a longer prison term. The itch to sue can tempt as it must have tempted Barug candidates for barangay captains. They were publicly accused by their political enemy of stealing public funds for merely failing to liquidate the expenses on time. Barug councilors are tagged "Team Suyop" and yet they are not suing.